A woman jailed for life for murdering her husband with a drugs overdose disguised in a curry has been told she must serve at least 16 years in jail. 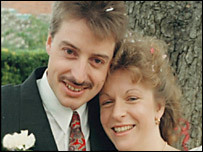 Dena Thompson, 44, of Devon, hid anti-depressants in Julian Webb's favourite meal at their home in Yapton, West Sussex, on his birthday in 1994. The minimum term was fixed by a judge at the High Court in London. Mr Webb, 31 and Thompson's second husband, was buried in a family plot in Hayling Island, Hampshire. His body was exhumed seven years later after Thompson was cleared in 2000 of trying to kill her third husband, Richard Thompson. A jury found the woman, of Cullompton, not guilty of attempted murder in 2000 at Lewes Crown Court. She was then found guilty of murdering advertising executive Mr Webb, whom she claimed had committed suicide. Thompson was refused leave to appeal against the murder conviction in 2005. Announcing the 16-year jail term, Mr Justice Ousely said: "Whether she is then released will be for the parole board to decide. "At that stage it will consider the need for the public to be protected from Thompson in the light of all that is known about her." She had committed cold and calculated murder, through trickery and without remorse, he said.